After our short stay in Co Durham we set off on the next stage of our trip – a week in Yorkshire. Son was going to a summer camp for a week, we had to drop off and pick up near Harrogate so figured we might as well squeeze a holiday in between – the first time in fourteen years without him. 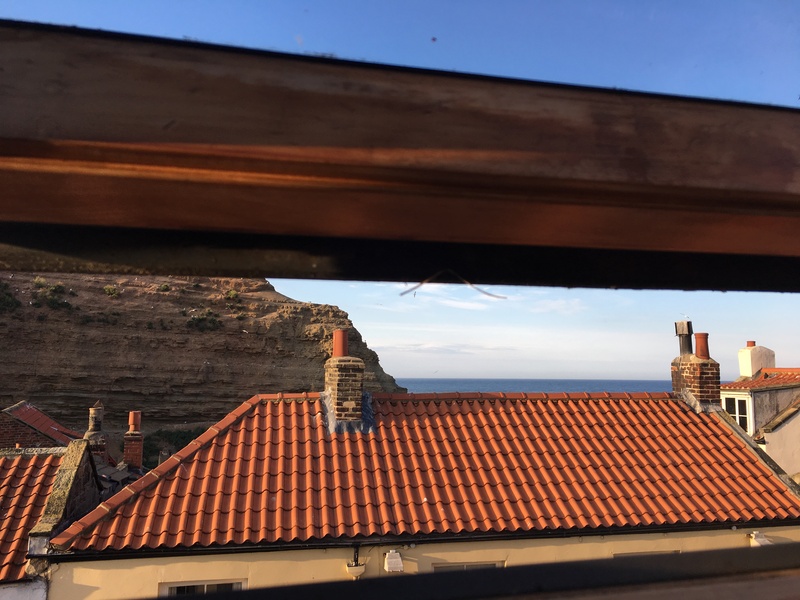 All a bit last minute, I fancied somewhere near Whitby and after some serious internet browsing and searching stumbled upon a little cottage in the village of Staithes. Neither of us had ever been there or heard of it, it looked quaint and the cottage seemed like it would suit us so after discovering the price was very reasonable I snapped it up. 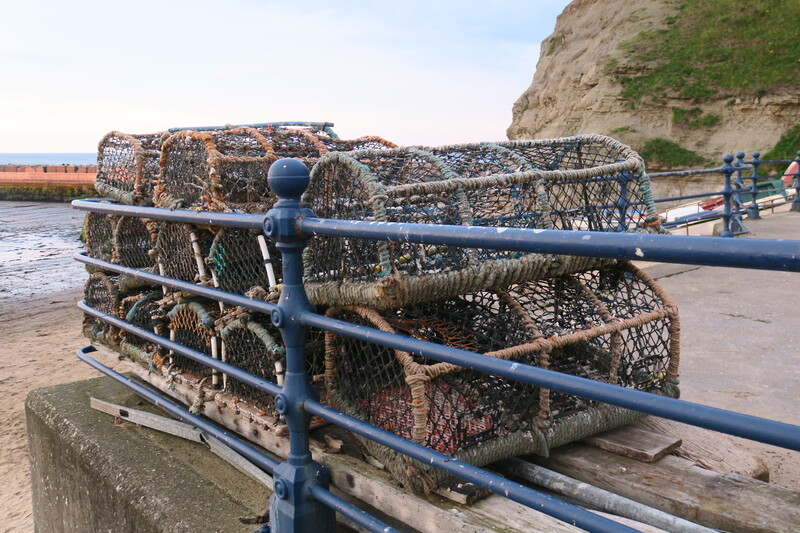 We dropped Son without a backward glance (from him) and drove to Staithes. 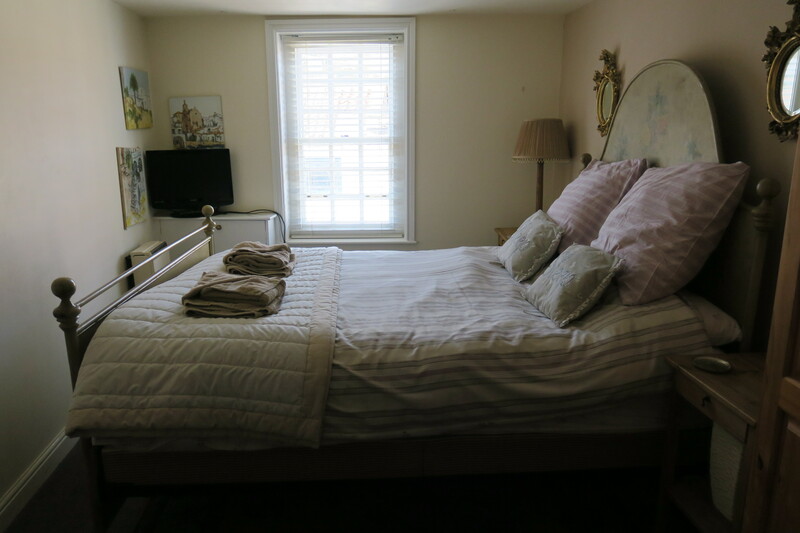 The owner of our cottage – Cinder Cottage – had been great and very responsive, we had all the directions and information to find it. 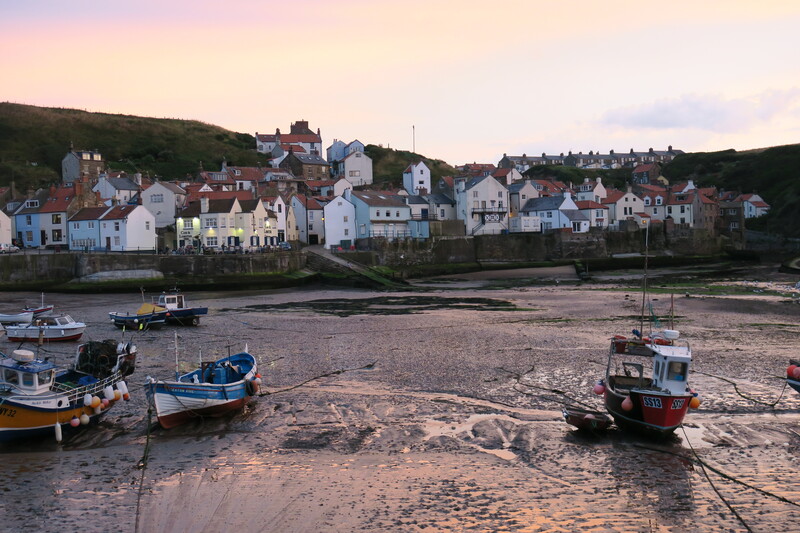 We stocked up on some provisions en route at a supermarket, sensible in hindsight as Staithes is a tiny village, and soon we were there. The directions were good, the cottage was easy to find and we parked our car on the main street and unloaded. Parking is limited in Staithes, we had 40 minutes to unload and move the car to a car park at the top of the village. Our rental included a parking pass for the week here. First impressions of Staithes were excellent. It is gorgeous with higgedly piggedly houses, a steep cobbled road into the village and the sea at the bottom of the main street. Not for the lesser mobile though – cobbles, steps everywhere and a hike up that hill to get to your car everyday is just for starters. We didn’t mind, although we were puffing a bit on the first day up the hill, by the end of the week we were positively racing up. Our cottage was just off the main street, up about thirty steps and was bijou and cute. A little dark downstairs but that was a minor point, we had found a gem. 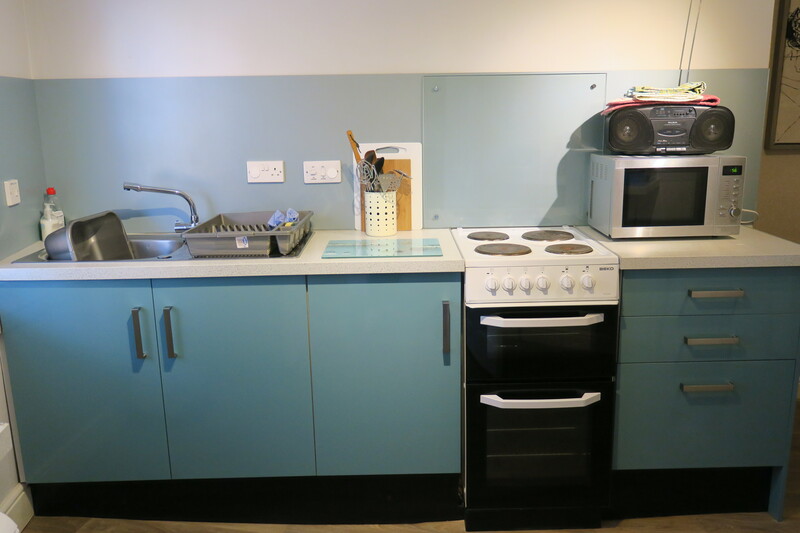 Downstairs had a small kitchen with cooker, fridge, microwave and small dining area. Two bedrooms at the back downstairs, there was a single where we stored our luggage and coats and then another small double bedroom kitted out in a shabby chic style and very comfortable. 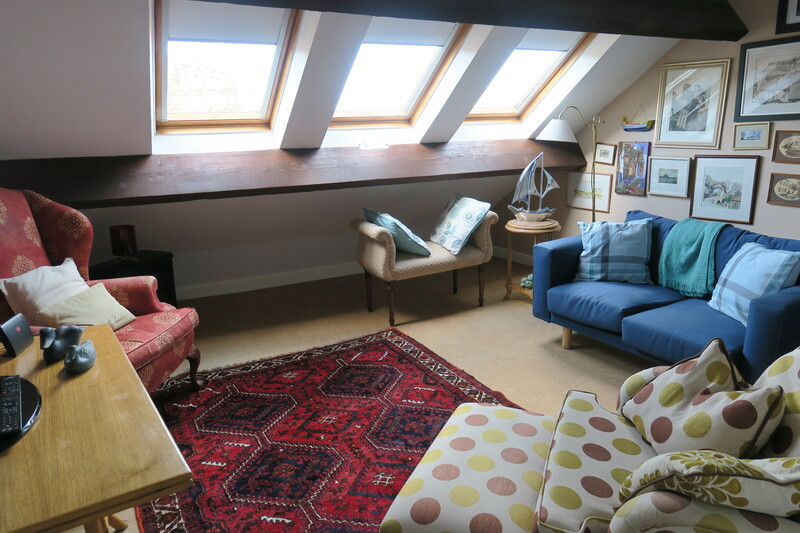 Upstairs we had a living room with dormer windows, plenty of comfy and squishy seats and a modern bathroom. 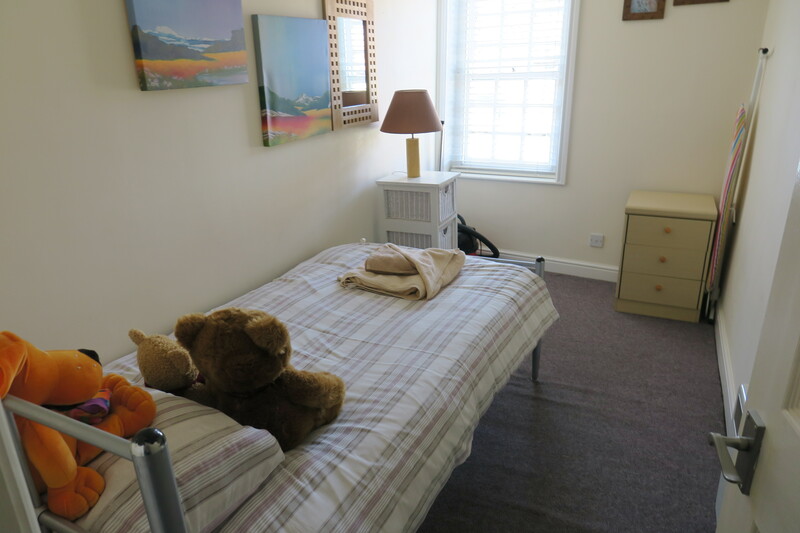 Everything was spotlessly clean and the location was perfect. If you opened the windows and peeked out you could see the sea. 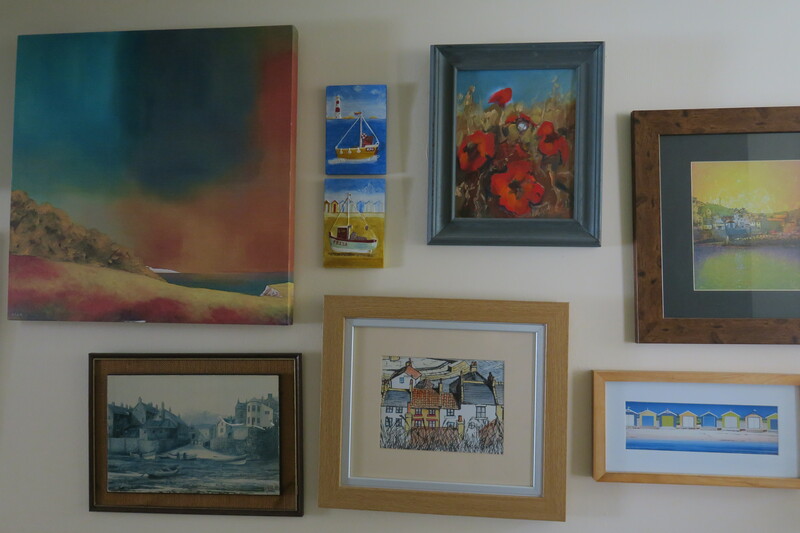 One of the things I loved about this cottage was the explosion of artwork. 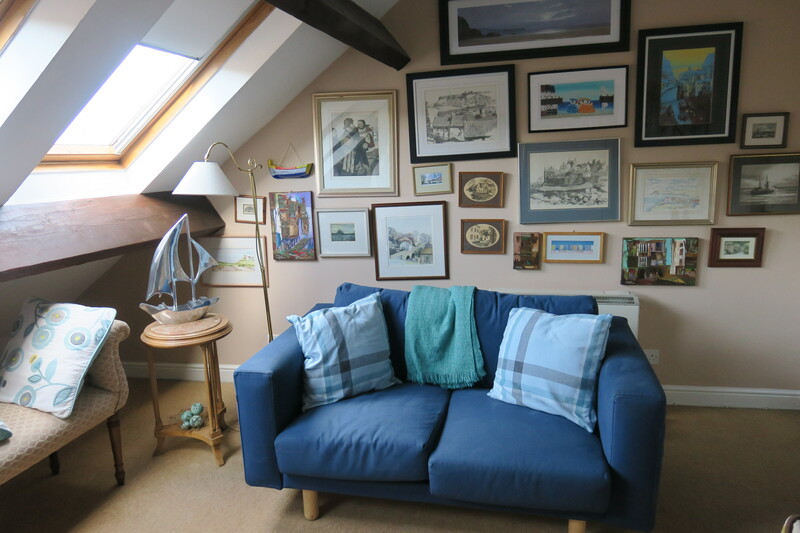 Every wall in every room was covered with pictures, many of them were views of Staithes and the local area. We couldn’t wait to have a stroll around Staithes, so unpacking left for later we headed out. 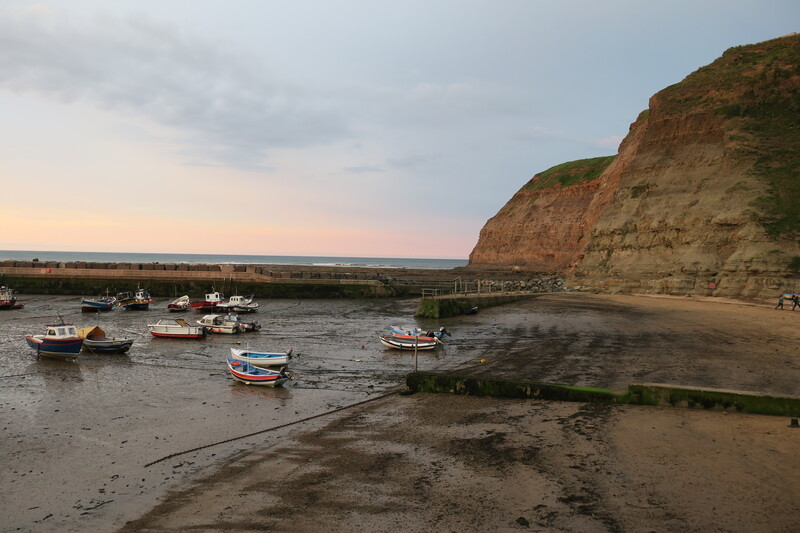 First impressions were correct and the more we strolled around, the more we fell in love with Staithes. 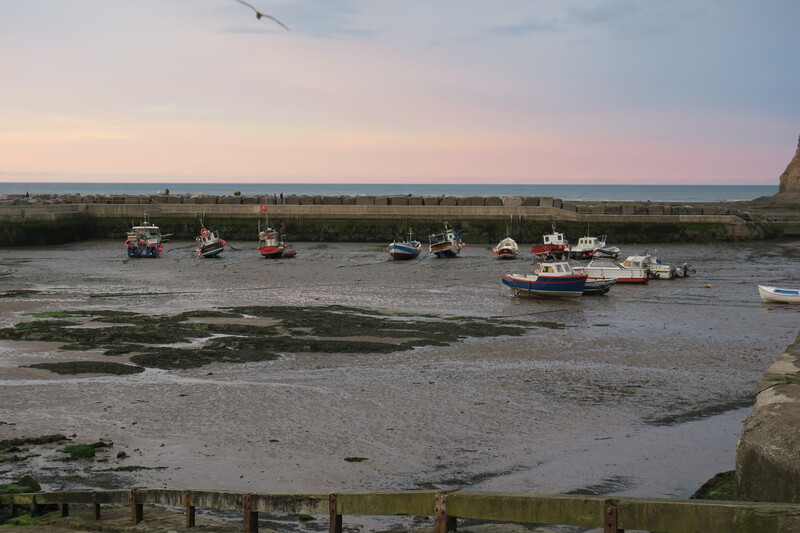 The cobbled main street led to a lovely harbour with a great looking pub – the Cod and Lobster and views out to sea. 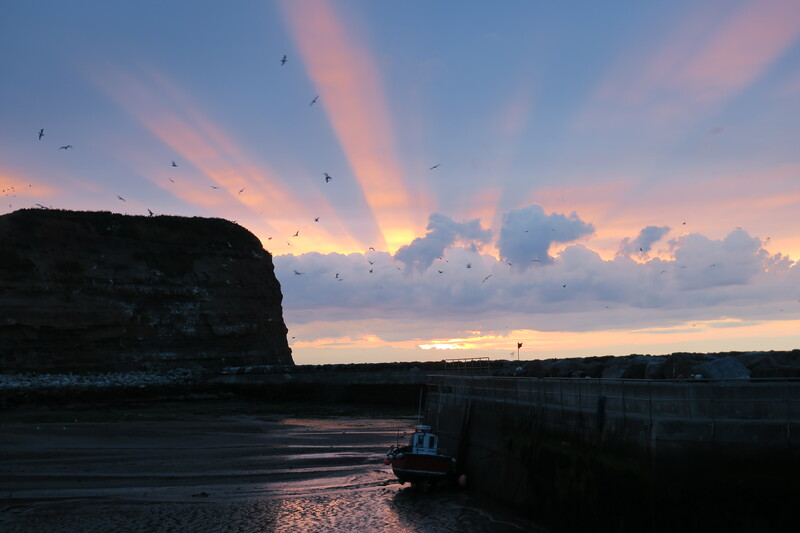 Some impressive cliffs – or nabs as they say here – and the most glorious sunset was the perfect welcome to Staithes. We both agreed we were going to like it here. 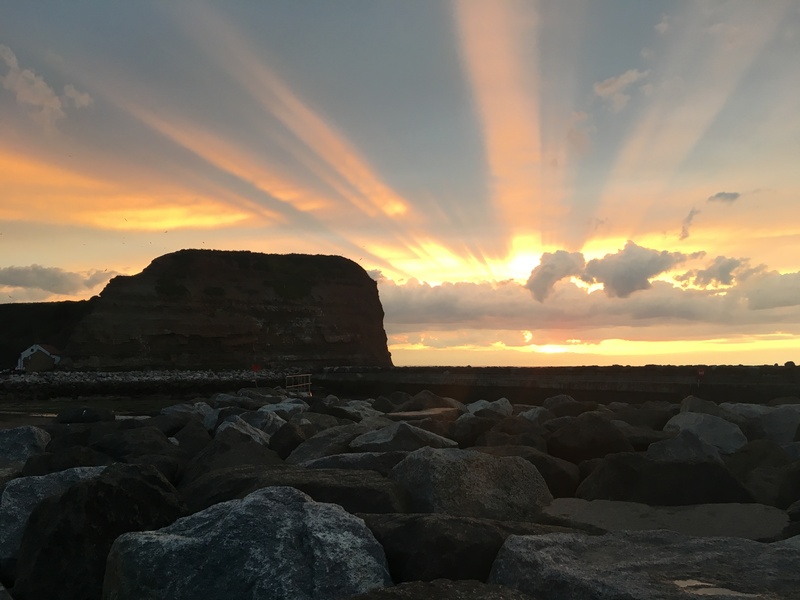 Thank you Sandra – we were so lucky to get a sunset like that on our first evening! It was a spectacular sunset – the best one of the trip so I’m really happy we managed to get pictures. 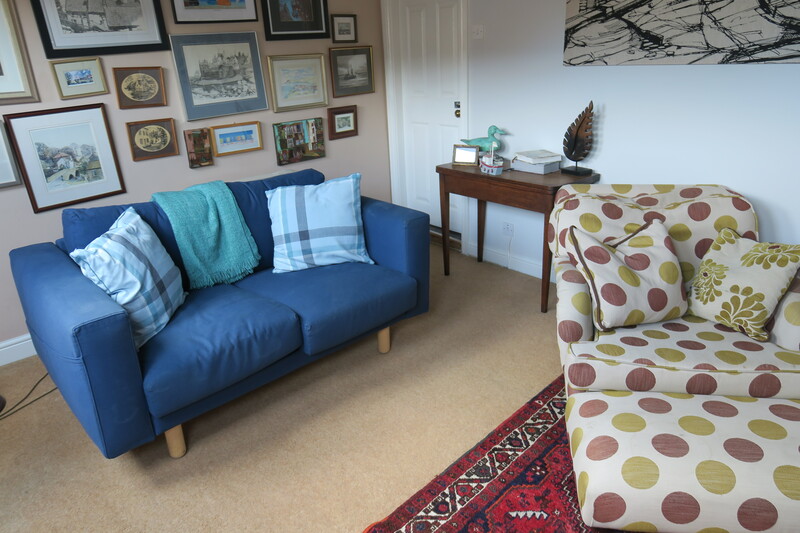 Staithes looks gorgeous Joy and your cottage looks lovely and cosy. 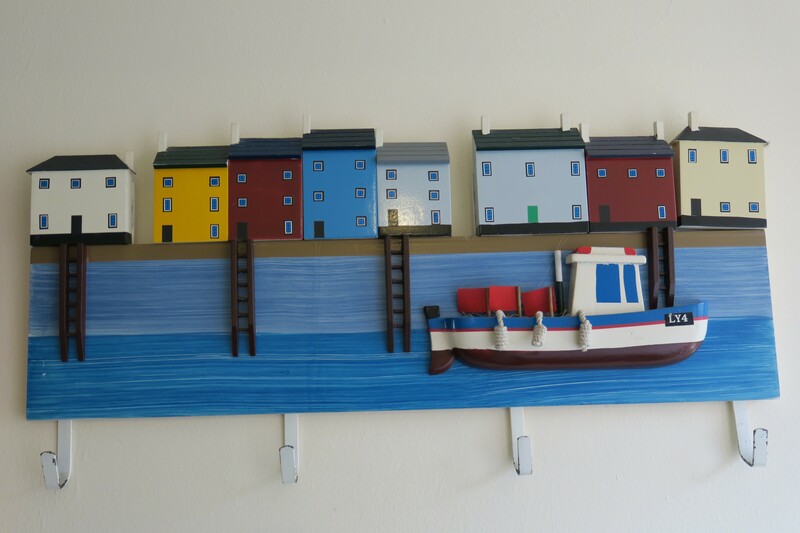 I especially like that shelf with all the brightly coloured cottages on it with the coat hooks below. The harbour looks beautiful and you timed it to perfection with your stunning sunsets. I’ve not visited Staithes but have been to Whitby twice. The last time was memorable because it was a hot, mid July day and I walked up all the abbey steps heavily pregnant. We returned home that evening and my son was born the next morning two weeks early! Surprisingly we haven’t been back since but I would like to sometime. That definitely was a memorable visit to Whitby Marion!! I’m amazed you walked up the steps two weeks before your son was due – that’s quite something, it must have helped him along making his entrance into the world though!! What a great story. 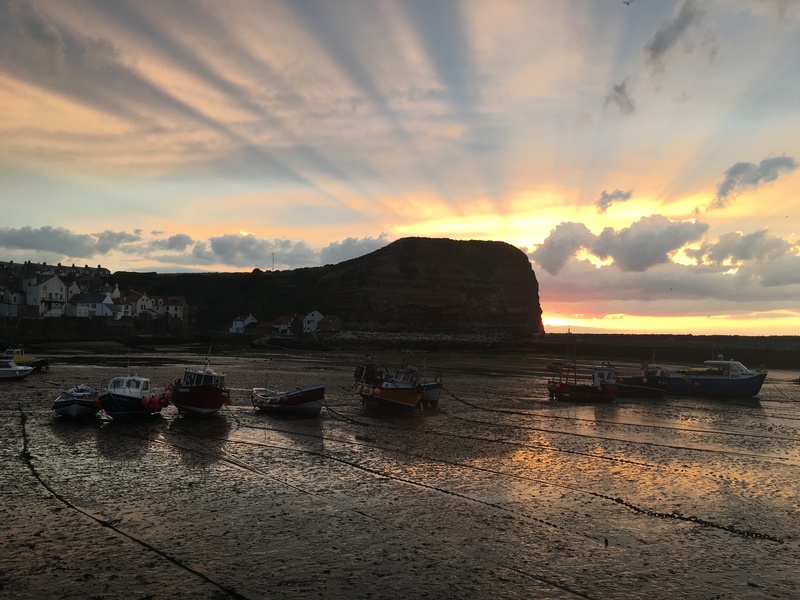 We loved Staithes, an accidental discovery as we were so last minute looking for a cottage but it turned out to be just perfect, gorgeous and lovely for strolling around after a day of exploring. Joy, Staithes looks like a wonderful little village. Can’t wait to see more! It was a very lucky find Pam – sometimes last minute things can work out just perfectly! We loved staying in this lovely little village, our cottage was so cozy and it was fun strolling and exploring all the nooks and crannies of the village. It was strange without him George, definitely a lot quieter than we’re used to!! I think if we lived in Staithes walking to get your car up that hill would fulfil the daily exercise quota!! Such a gorgeous little place this is! Very idyllic – perfect for a relaxing break. Amazing sunset pics! It really was the perfect spot to base ourselves for our week away – so quiet and pretty. The sunset on that first evening was the best of the week, so glad we managed to catch it on camera! 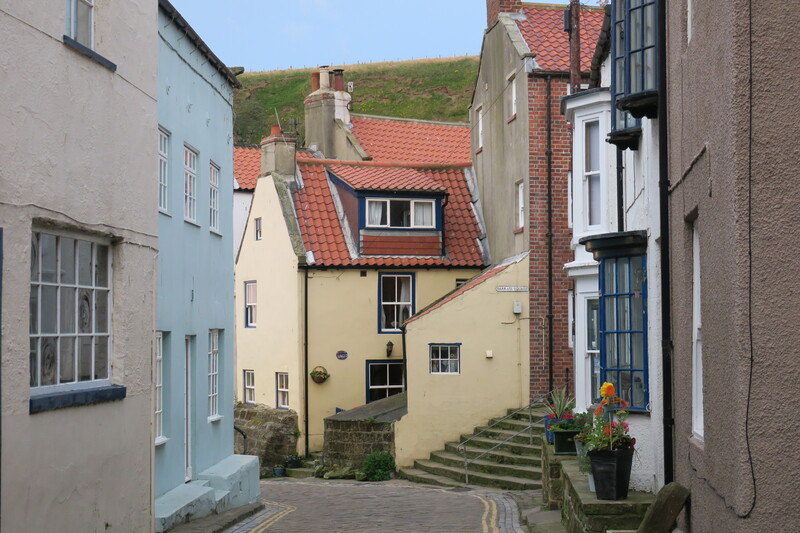 I’ve only heard of Staithes before because of a children’s programme F used to watch. Looks like it’s worth a visit and that hill appears to provide good fitness training! Old Jack’s Boat? We didn’t know it but saw an Old Jack’s trail around the village and key locations in the programme which looked fun for little ones. It was a really gorgeous little place and you’re right about that hill – no problem with overindulging in fish and chips here when you have to hike that each day! Yes, that’s the one with Bernard Cribbins. F would have loved the trail 3 or 4 years ago. We keep getting these things wrong. Her favourite programme now is set in Bamburgh Castle – a year after we were in that area on our Northumberland trip. It would have been a wow location this summer! Gorgeous sunset, and beautiful village. Thanks for the tour! It really is a gem of a place, so unspoilt and lovely. We lucked out with that sunset too – the best one of the week so I’m glad we caught it. I have never been to Staithes. It looks gorgeous, especially basked in that beautiful light. The cottage looks wonderful too. I hope you enjoyed your child-free break. It felt quite strange to be going without him but we did actually have such a great week. He rang us a couple of times and was thoroughly enjoying himself so we felt obliged to do the same!! We did so much hiking and other things that he would have moaned and groaned about so that was quite nice. 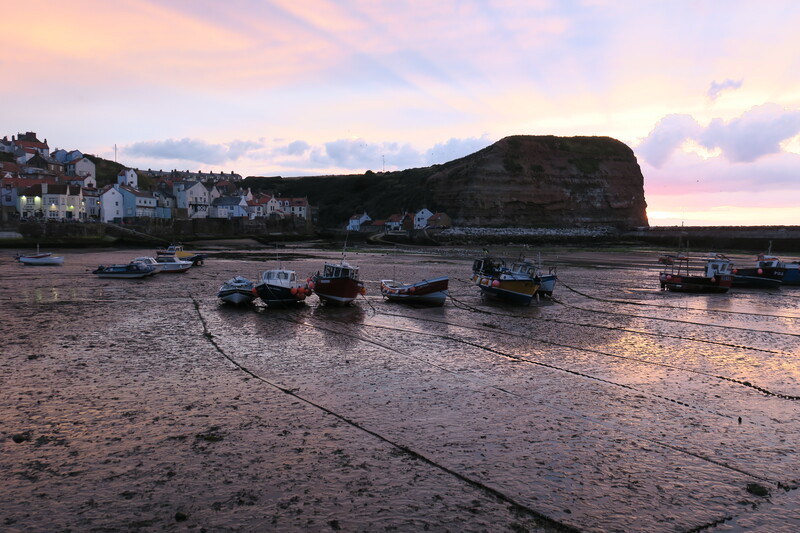 Staithes was the perfect place to stay, such a gorgeous and unspoilt little village I loved everything about it. We have been lucky enough to have some mini-breaks without the kids throughout the years. The kids are always happy and it is quite restorative to just be grown ups for a bit. Looks good. I have seen this place and have promised a visit but it looks difficult to get to? 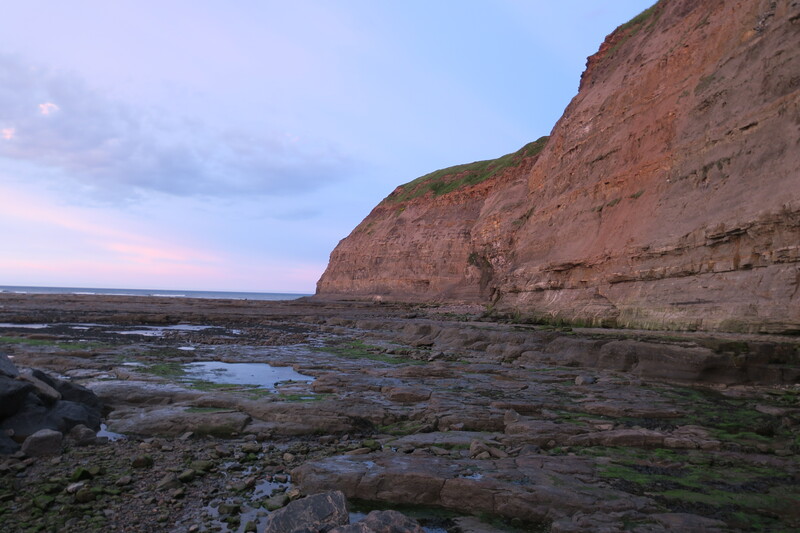 It’s about 15 minutes from Whitby and about 20 minutes from Redcar right on the coast. 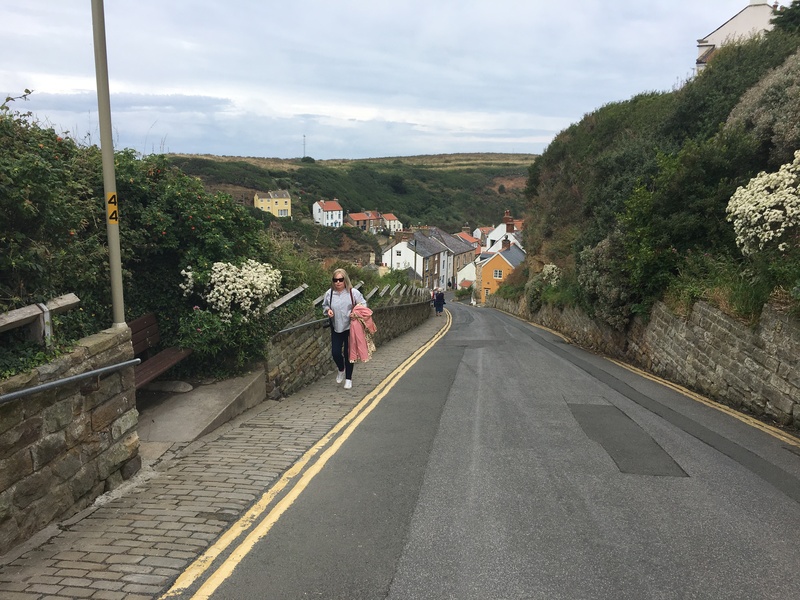 You do need to leave your car in the car park right at the top of the hill – walking down is fine, back up gets the heart pumping but is ok. It’s very sleepy and peaceful, 2 pubs, a handful of shops but it seemed like mostly holiday cottages and accommodation in the village. We loved it, some great walks and watching the sunset (when the weather isn’t cloudy and pouring with rain – most days when we stayed) is spectacular. Fun, glad you 2 finally got time by yourself. Ours didn’t happen in what seamed forever with 3 kids. Wonderful sunset photos. We enjoy our son’s company and love travelling with him but it worked out well this first time on our own too. Funny how kids change your life and it’s like they’ve always been there!! We were lucky to catch that sunset on our first evening, it was glorious. Yes it is different, we loved to travel with our 3, although we found it very nice as they grew up, moved out and we were able to enjoy vacations on our own. It was a learning curve after so many years of having them around. Gorgeous, gorgeous photos. The light is amazing – those would fit right in to an inspirational calendar! Wasn’t it a wonderful sunset – quite unexpected too as the weather hadn’t been all that good earlier in the day. I could watch that every evening and never fail to be moved. Me too. No matter what happens day by day, the evening sky is so inspiring. It’s like a breath of rest and possibility. Lovely. Hope your first day of fall has been just as inspirational… Back to school business requires a huge amount of parenting fortitude! I know exactly what you mean!! After the long summer holiday from school we all struggle a bit!! As always I am joy your travels. I especially liked in your apartment with the coat hook. Wasn’t it such a great little coat hook! It looked just like the village. It was a lovely place to spend a week – we were very lucky. Kids eh – he raced off full of excitement and we were left standing a bit bemused and not sure what to do!! such a pretty village and a nice cottage:) really, this was your first trip without your son? 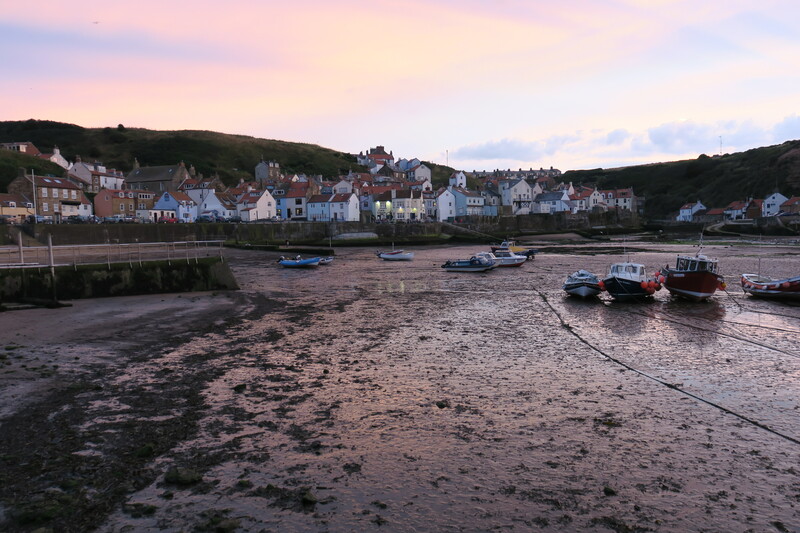 It was a great week Tanja, Staithes was one of the loveliest places I’ve stayed, so unspoilt and beautiful. Yes, this was our first trip without him – almost since birth we’ve just bundled him up and brought him along. It’s fun travelling with your child I think, this was unusual for us but we did enjoy it! We hadn’t thought about it ever before, it was a last minute thing but I’m so glad we came. It is the most beautiful little place. What a pretty place and you have caught a stunning sunset! My favourite pic is third from the end – just gorgeous. And I love the art wall behind the sofa. I thought we had a lot of pictures but our walls are sparse compared to that. The sunset on our first night was incredible – the colours were stunning. 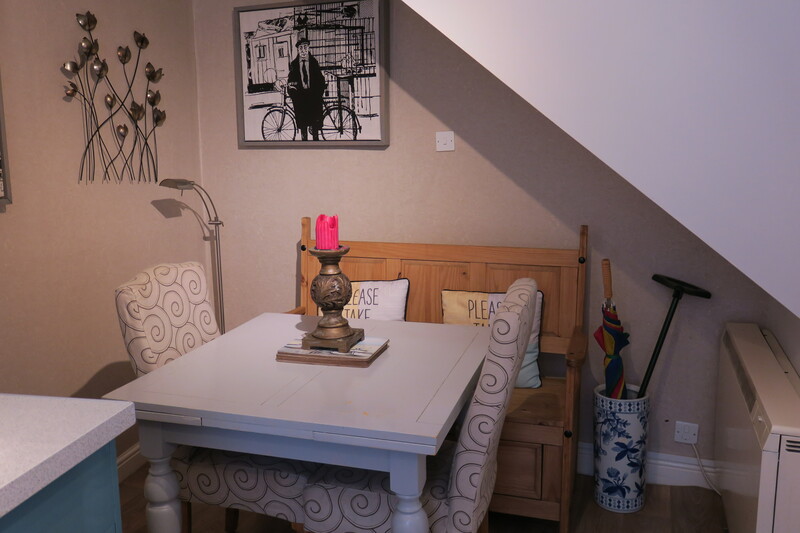 I loved that art wall too – it just made the cottage really special. Isn’t it just lovely, so unspoilt, pretty and we were so lucky to stay there. The living room upstairs is a nice lounging area and with a nice view as well! And your sunset photos are incredible. I’m jealous! I loved that when we opened those roof windows we could see the sea!! That sunset was special – we didn’t get another quite like it during our week there so I’m glad we got it on camera! Wonderful sunsets and so beautifully captured. After a day of bad weather we were so lucky with those incredible sunsets – nature at its finest! 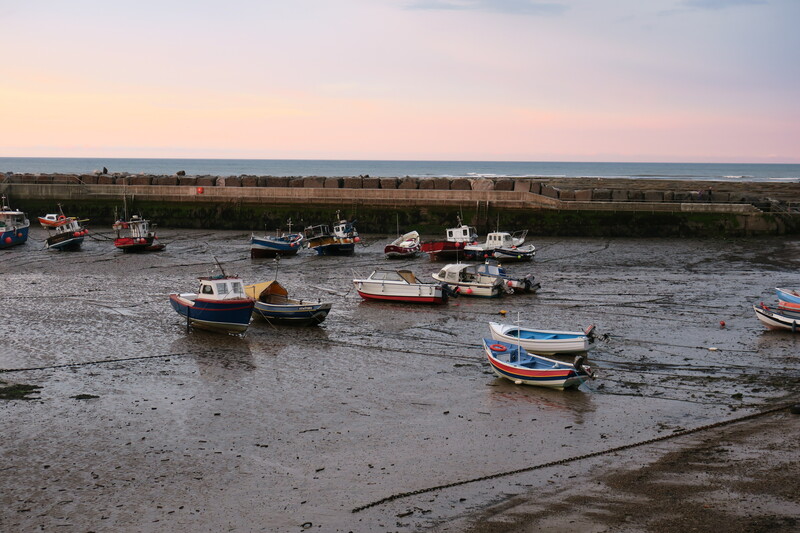 I’d heard Staithes was beautiful, but it looks so much more than that from your photos! I never made it there while I was living in Yorkshire, and I’m itching to go back up there and check out the places I missed. It really was gorgeous, every evening we just mooched about and explored and I couldn’t get over how lovely it was. An accidental choice for us, all very last minute but I’m glad we got to stay in Staithes! 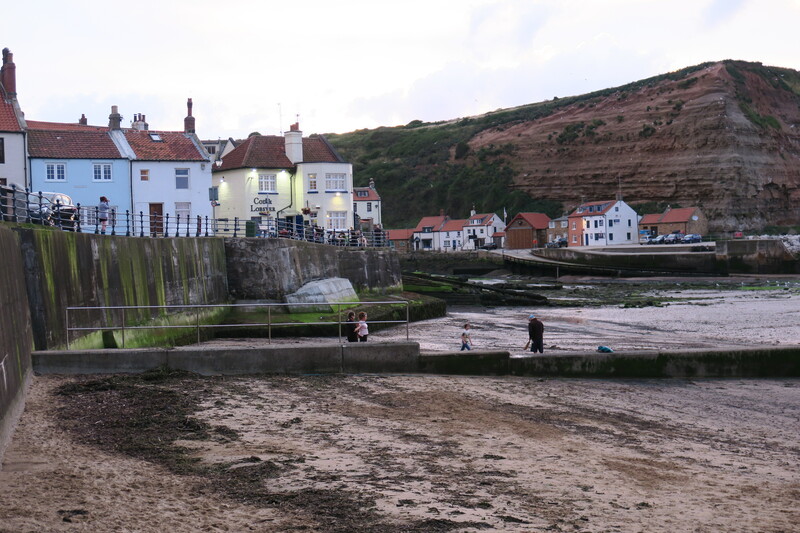 I had been to Whtiby and Robin Hoods Bay years ago with my parents and that was where I was aiming for on this holiday Rosemary, we were just so last minute I couldn’t find suitable accommodation in either of those places. Staithes was somewhere I’d never heard of but liked the look of the cottage and booked it. 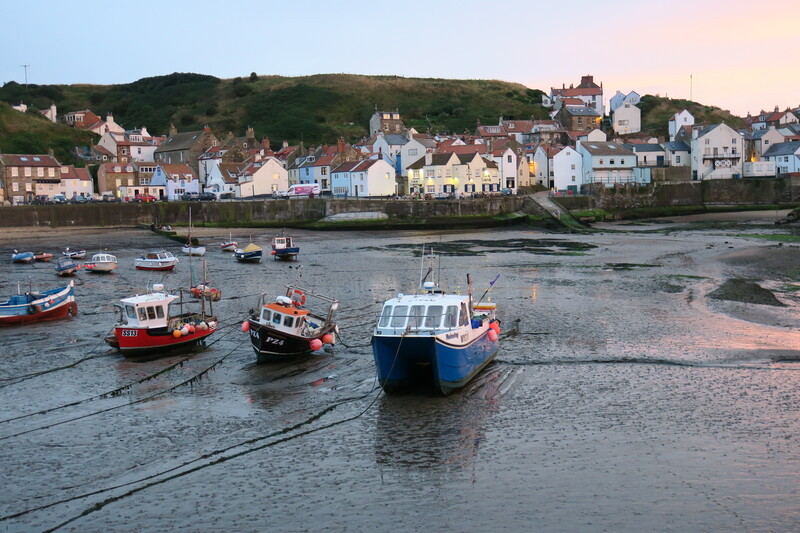 We both loved everything about Staithes and wandering around in the evenings after dinner was wonderful. Sometimes you just hit it really lucky – that’s what happened here! 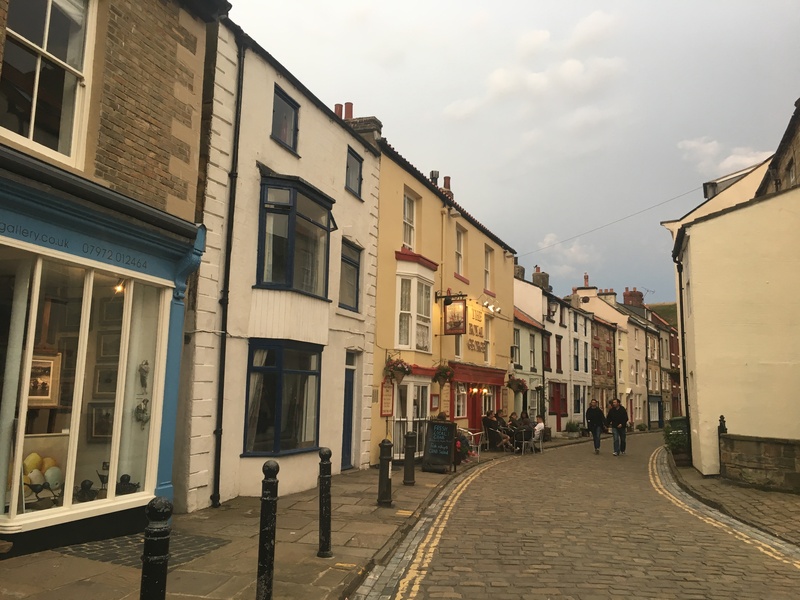 Absolutely Joy – it must have been a bit quieter than Whitby or Robin Hood’s Bay as they are both very attractive to tourists! Sounds lovely wandering round in the evenings after dinner right by the sea – must have been so peaceful (albeit a bit chilly!). Stunning photos and the cottage looked so quaint and cozy! how wonderful that your son was excited about camp! I hope he enjoyed it!? He had the best time and loved every second of it. Sleep deprivation seemed to be a thing though – he was exhausted when we picked him up. What about showering? Mine needed about 5 showers before I was convinced he was actually clean again! LOL! Ha ha!! Must be a boy thing then because we had the exact same experience – I don’t think washing really crossed his mind!! He came home in the same clothes he arrived in, the bag I had so carefully packed had barely been touched so clean clothes weren’t a priority either!! Mine wore his swim suit for almost the entire time – day and night! ha ha! Thank you – it is the most gorgeous village. We loved the village and everything about it – so glad we got to stay here for a week and enjoy its beauty.